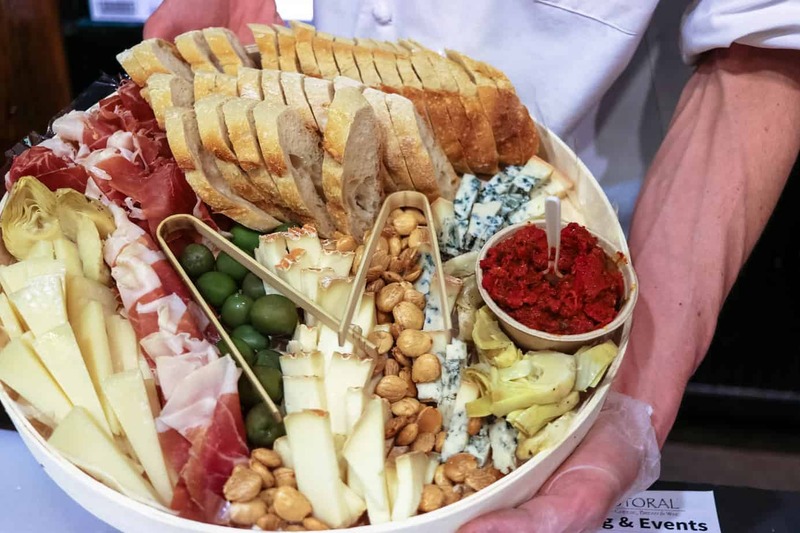 The Chicago French Market hosted a Spring Soiree, fittingly on the first day of spring, where attendees were allowed to sample and taste from their 30 plus artisans and purveyors. The Soiree was my first visit to the market. All I can say is WOW, well I could say more, lol. I’m so excited about this place and I can’t wait to return. I declare it a MUST for anyone living in or visiting the city of Chicago! Located in the Ogilvie train station in Chicago’s West Loop, the Chicago French Market is the city’s only year-round indoor Market allowing continued access to fresh, local artisan products while supporting local farmers. Visitors have a variety of choices of produce, sweets, wines, fresh flowers, seafood, baked goods, sandwiches, espresso, and meats to name a few. I was pleasantly surprised at the assortment of options. The market’s 30 plus vendors were all hand selected because of their passion and high-quality products. The best of Chicago and surrounding areas, mostly family-owned businesses, entrepreneurs, and skilled purveyors. The market, open since 2009 is operated and managed by the Bensidoun family, the largest market operator in and around Paris since 1953. In addition to the Chicago French Market, the family operates nearly 100 open-air and indoor markets throughout the U.S. and Europe. I’m kicking myself for missing out on this gem all of these years. Chicago never ceases to amaze me! I’m discovering new things to love about this magnificent city every day. I swear I’ll never run out of material to share. Put the Chicago French Market on your list! The Spring Soiree allowed VIP access to all the vendors. My dreams materialized! My partner in crime for the event was Chicago Chef April Lee otherwise known as The Tipsy Housewife (she’s an amazing chef and person, check out her blog for incredible food and cocktail recipes)! After check-in, our first stop was at the bar where I got a glass of Malbec; it was a long day at the office, lol! Now I’m ready! Perusing the map was a bit overwhelming at first glance as I wanted everything STAT (I ate a light lunch in preparation)! The following are a few highlights and favorites. Our first food stop was Aloha Poke Co. I was already a fan of Aloha Poke’s Revival Food Hall location. If you haven’t tried their poke’ bowls, I encourage it. The ingredients are fresh, and the combination of textures and flavors are delightful. We had their Crunch Bowl with marinated tuna, tempura crunch, edamame, scallions, cucumber, jalapeno, spicy aioli, tobiko, and sesame seeds. I wanted a bigger bowl of this! We then moved on to Lito’s Empanadas, a new market vendor. Their empanadas are described as Argentinian style as they use a cured wheat-based dough. This technique allows for all of the cooking mechanisms to work without absorbing a lot of the oil as opposed to using a corn base, which soaks up the oil. Perhaps you, like me have noticed that some empanadas look more brown and oily than others. You can truly taste the difference! The dough was fantastic! I planned on circling back and purchasing some to take home to my family but ran out of time; I’ll be heading back for these empanadas! Ahhhhh Spring! The flowers at Les Fleurs were a welcome sight and gave me all kind of good spring feels on a frigid day. Les Fleurs provides beautiful floral arrangements for every occasion along with plants, jewelry, home décor, as well as French themed seasonal gifts. The custom, hand-tied bouquets start at $25! Before the event, I received a map and list of all the vendor participants. I was very excited to see Da Lobsta listed and was looking forward to one of their lobster rolls. I often see their food truck parked at different locales throughout the city. The lobster rolls are soooo good. There was plenty of lobster stuffed inside. That bun though, I must say that I’m a bit obsessed! Another favorite was the pastrami bites from Bebe’s Kosher Deli. I admit, I ate more than one sample…couldn’t help myself. The pastrami was amazing, and I’m not really into pastrami. I truly need to stop saying what I don’t like or care for because I’ve changed my tune on quite a bit of food. I guess I’ve just been going to the wrong places. Or I didn’t know what I was doing when I cooked certain things, lol. I’m just keeping an open mind now with a clean slate regarding foods I previously didn’t like. Except for okra…no way will I ever like that stuff! Bebe’s uses high-quality ingredients to create their recipes passed down from generations. All of the Kosher meat comes Romanian which I learned is a big deal in Chicago! Romanian makes all of their kosher meats fresh, in-house. Next stop was Wood Fire Counter for some comfort food. We tried the gumbo mac and cheese. Yum, I enjoyed the spices and flavor of this. The pasta texture was on point too. On to cheese sampling at Pastoral. With a reputation for high quality, Pastoral Artisan Cheese Bread and Wine offers artisan cheeses from America and around the world. Their cheese is incredible! Anyone else in love with cheese as much as I am? I don’t know if there’s anything that can make me give up cheese. In addition to cheese, Pastoral has a selection of small production wines, hand-crafted, cheese-loving beers, and freshly baked bread along with accompaniments. Their gourmet baskets would make great gifts! Be sure to stop by Firenze during your visit. New to the market, Firenze brings you authentic Italian street food as found in Florence, Italy. Pictured below is the Prosciutto Mozzarella: Schiacciato Bread, Prosciutto, Mozzarella, Arugula, Truffle Cream, Olive Oil, and Balsamic Glaze. YES!!! Fresh and delicious! I could only eat ¼ of my sandwich. I took it home to finish the next day and it was still just as good. Spotted more pastrami, this time from Fumare Meats and Deli. Theirs is a Montreal Style pastrami; cured and natural smoked brisket peppered and slow-cooked daily on site. Another good choice! Dessert lovers will enjoy the variety of sweet treats offered such as the crepes from Flip Crepes. They’re gluten-free too! I had the Nutella, yum! There’s a nice collection of spots selling handmade chocolates, tarts, candies, gelato, and donuts to name a few. Your sweet tooth will indeed get satisfaction here! This is but a glimpse into the many offerings at Chicago’s French Market in the West Loop. Told you it’s a must-see. I could go on and on…I ate a lot more than I mentioned here. I hope that you get the opportunity to spend some time here. You won’t regret it!